When journalist Bill O’Hagan turned his passion for sausages into a business in 1988, O’Hagan’s became the first specialist sausage shop in the world. Since his Dad’s death four years ago Liam continues to fly the flag for Bill’s award-winning bangers. “I used to help Dad even before he started the business and just did it as a hobby in his shed,” said Liam, who was five-years-old when Bill got him involved. Leaving Chichester High School at sixteen, Liam continued to help out in Bill’s increasingly successful sausage empire, studying for a degree in social policy alongside. “My degree has nothing to do with sausages, but I have been running the business for about ten years now. Today we have a small shop in the Woolpack Inn in Fishbourne and we supply pubs and restaurants all over the UK. We also supply sausages to several local Co-op stores for their Local Foods range,” said Liam, going on to explain what makes an O’Hagan’s sausage so special. “We only ever use really good quality ingredients and the best cuts of meat. We don’t use any mechanically recovered meat, genetically modified ingredients, colourings, preservatives or any other artificial additives and we also mix all our own seasonings. “Some of our recipes are years old; we have one that dates back to Mrs Beaton’s first edition in 1863. Dad always looked in old bookshops for recipes,” he laughed, recalling a childhood that entailed many hours spent in dusty bookshops while Bill leafed through yellowing pages of old cookery tomes. “Our own recipes can take years to research and refine, but we produce a wide range, including gluten free sausages and exotic sausages. One of our own and a best-seller at the moment is Sussex Smokey, which includes honey, paprika, mustard and spices. Smoked in natural smoke liquid, Dad and I created that one,” he told me with pride. Now in great demand at festivals, farmers markets, weddings and events, Liam enjoys the social side of the business. Asked if he has an apprentice to train up the way Bill trained him, Liam grinned. “My son’s sixteen months old, but I’ll give him another year and start getting him involved,” he said, chuckling as he passed me a ‘just cooked’ pork sausage to try. 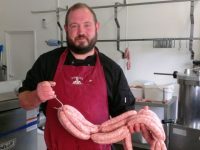 For more information about O’Hagan’s sausages visit www.topsausages.com.